The cottage style is an appealing model for your backyard. This model features an 18″ overhang on the front eaves side over the doors and the windows to help keep weather out when they are open, and to add some extra flare to the structure. The off-center roof line gives your building a distinct look to compliment your landscape. The cottage is available with 2 different roof pitches. 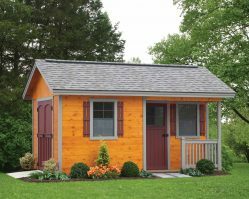 The standard cottage has 5/12 roof pitch, rear wall height is 6′ 4″ inside, front wall height is 7′ 11″ inside, the Deluxe Cottage has a 7/12 roof pitch, a 4′ 8″ rear wall height inside, and a 7′ 7″ front inside wall height. 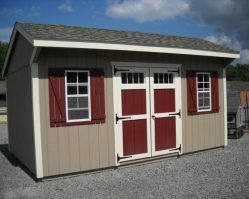 Heavy Duty Cottage Style ~ 6 year warranty. These structures are available in 17 sizes from 6′ x 6′ through 12′ x 40′. You also have 6 siding choices available to you: 50 year LP Smart Panel, Fir Duratemp siding, Lifetime Vinyl Siding, Board ‘n Baton siding, Wood Log Siding, Cedar Shiplap Siding.